NOW Broadband (or NOW TV Broadband, as you may see it referred to), is a home broadband offering from Sky which, combined with Now TV, provides broadband and TV bundles on flexible terms with minimal hassle. The company was launched in 2012 as an internet television provider offering access to Sky TV content without long contracts or a satellite dish. In 2016 it moved into home broadband, and differentiates itself from its parent company with the addition of short term agreements. If you’re after an internet only, or broadband and TV bundle, but have been put off by high costs, long contracts or the need for lots of extra hardware, NOW TV Broadband deals are a compelling alternative. What does NOW Broadband offer? NOW Broadband offers both ADSL and fibre optic broadband over an Openreach (BT) landline, with a free Wi-Fi router for network connectivity in your home. This provides average download speeds of 10Mb on ADSL and either 36Mb or 63Mb with fibre. But unlike many other broadband providers you’re able to get any of its broadband services on a flexible rolling monthly (no contract) agreement. That means you can cancel at any time without having to pay a large termination fee; useful if you require broadband for a short period of time or if your long term living arrangements are uncertain. It’s perfect for contractors, students and anyone else who needs more flexibility from a broadband deal. NOW TV internet deals are also a good option if you need broadband without a credit check, as they only require a 10p balance to verify your account. What else does NOW Broadband offer? NOW started as a TV provider, and this remains a major part of its offerings. Every NOW TV subscriber gets an Entertainment pass which offers loads of top channels including Sky 1, Sky Atlantic, Comedy Central and UK Gold, along with hundreds of box sets to stream on demand. You can also optionally add a Sky Cinema pass for access to 11 movie channels, seven sports channels with the Sky Sports pass or keep the little ones happy with six children's channels in the Kids pass. Passes can be added or removed at any time without charge. 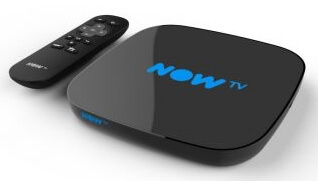 The new NOW TV Smart Box included with these bundles also has an integrated TV tuner so you can use it to access Freeview channels as well as catch-up from the likes of iPlayer and All4. All of these features are available on either a 12 month contract or rolling monthly agreement for greater flexibility. Phone services are not the main focus for NOW TV, but you must take a phone line in order to get broadband, and when you do you’ll have the option of adding inclusive evening and weekend or anytime calling. If you don’t need any call packages you can simply take the line on a pay-as-you-use basis. Getting NOW Broadband depends on your home being within their network area, but this covers the majority of premises so almost everybody will be able to sign up (it's the same as Sky Broadband so if you've had - or know you can get - Sky you can also have NOW Broadband). The type of broadband is dictated by the services available at your exchange - some homes will be able to choose either standard ADSL or fibre optic, while others may only have ADSL. To see what you could get, enter a postcode into the Broadband Genie comparison table to filter packages by location. Further checks will be carried out by NOW TV to ensure you’re able to get your chosen service. Fibre connections are great for busy families or anybody doing lots of demanding tasks like streaming HD video and downloading large files. But if you don’t need the high speed of fibre you can save some money with the cheapest NOW TV package and still make full use of all the internet has to offer. For more information about broadband performance and choosing the right package read our guide to broadband speeds. All NOW Broadband deals are totally unlimited, with no fair use caps or traffic management. NOW TV’s unique offering of TV and broadband on a rolling monthly contract is not for everyone, but it will be a compelling option for students and others who wish to avoid the hassle of cancellation fees. And even if you’re not interested in no contract broadband NOW TV’s longer term deals are still good value, combining fast unlimited broadband and very flexible and affordable TV bundles. But you must be willing to take both the broadband and TV together as NOW TV does not offer a standalone broadband service, you also won't find many (or any) deals with free setup - so you'll likely have to pay an installation fee. It also requires you to be within a NOW TV network area which - while it does encompass a majority of properties - does not cover quite as many homes as other providers.